The MDC rally in Gweru on July 22, 2018. MDC Alliance presidential candidate Nelson Chamisa has accused President Emmerson Mnangagwa and his Zanu PF party of attempts to soil the opposition front's image through claiming their non-existent links with former President Robert Mugabe and his wife, Grace. 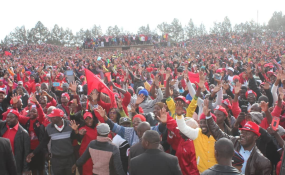 Addressing thousands of party followers who attended his star rally in Gweru on Sunday, Chamisa dismissed as "hogwash", continued claims he has clandestinely offered the former first lady the position of Vice President in an envisaged MDC led government. "I am hearing some individuals propagating malicious lies that I want Grace Mugabe to be the Vice President; that is hogwash," he said. "The peddling of such lies is a clear indication that Zanu PF is now desperate. That is why they are peddling such lies. "Grace Mugabe is not a member of the MDC Alliance; so Zanu PF must not peddle such lies." "Mnangagwa and (Vice President Constantino) Chiwenga were part and parcel of the Mugabe administration. Since there is now lost love, they want to shove Mugabe to us. You have been together in running down this country. Have you ever seen me being a Zanu PF member?" he asked. Meanwhile, in his address, Chamisa praised former Zanu PF heavyweights and one-time provincial affairs ministers in Mugabe's now defunct administration, Eunice Sandi Moyo and Kudakwashe Bhasikiti who both attended the rally. "I want to applaud Mrs Moyo and Mr Kudakwashe Bhasikiti who are with us here today. We have come to a point as a country where every vote counts. "Mrs Moyo, you have been with Mnangagwa for a very long time and being with us here today shows us that you have realised his evil ways and that is commendable," he said.